In 1999, Trish’s unrelenting passion to recreate the beauty in life deepened, when she discovered the workshops of Frank Covino and his unique method. She noticed how he took more of a Classical and Academic approach to painting, and that inspired her. This Renaissance method gave her the tools needed to freeze time and recreate beautiful portraits, still life and landscapes which morphs into music for the eyes. 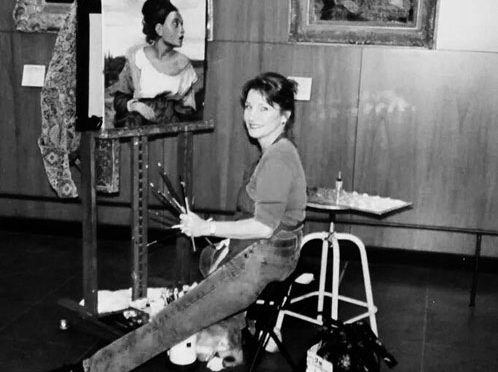 In October 2000, Trish was chosen as one of 12 artists invited to paint in the Louvre. In April 2006,Trish experienced another approach to portraiture from the world renowned Nashville artist, Michael Shane Neal in his weeklong workshops. She found that his approach to portraiture was painting in a Sargent like manner called “brushy realism”. She truly enjoyed taking these workshops from Shane and will continue to study his method which will only enhance her brushstrokes. Young Woman with a Violin was selected for in the 2013 “Best of America” National Oil and Acrylics Painters Society in Bolivar, Mo. Daybreak at East Dock, was selected for 2014 “Best of America” National Oil and Acrylics Painters Society in Bolivar , Mo.